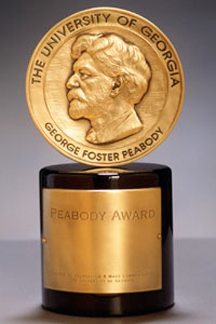 The George Foster Peabody Award. The Peabody Awards are given annually for international excellence in programming. Through most of their history, recipients have been in radio or television broadcasting, but that is now changing to include Web-based media. The awards are administered by the Henry W. Grady College of Journalism and Mass Communication at the University of Georgia, and unlike many media awards, there is no set number each year. Nor are they given in pre-determined categories such as Best Documentary or Best Actress. That is, to their credit, they do not suffer from the Manager-of-the-Year problem. According to the Peabody Web site: "Each year, from more than one thousand entries, the Peabody Board selects outstanding works exhibiting excellence, distinguished achievement, and meritorious service by radio and television networks, stations, cable television organizations, producing organizations, and individuals. Though there is no set number of awards, no more than 36 have ever been presented in a single year." Incentive programs usually work less effectively than we hoped, and sometimes less effectively than we believe. Rarely do we measure incentive effectiveness, and if we do, the measurement is problematic at best. Still, some practices related to incentives are probably counterproductive, and it's easy to find ways to improve. Here are some insights that might help improve incentive programs. We tend to ascribe a "motivational power" to incentives that's roughly proportional to the monetary value of the incentive. Generally, a trip to Hawaii is believed to have greater motivational power than an iPod. But motivational power isn't necessarily proportional to market value. For instance, an employee with a chronically ill child might not be able to take a trip to Hawaii — ever. Moreover, some incentives have emotional power but almost no economic value — like the Peabody Awards. Many incentive programs have parallel threads that interact outside our awareness. Interactions occur when people are eligible for more than one incentive. For instance, "if you win this, you can't win that." Some organizations have policies prohibiting sequential wins. These effects can demoralize. Winners of incentives from which others have been disqualified can feel that their awards have been cheapened. The resulting benefits the organization was hoping for might not materialize. The effects of recognition awards don't accumulate, like say, money, because the effects of two awards are reduced when they occur close together. Recognition has powerful, positive impact. But for recognition events to be distinctive, leave some space between them. In many organizations, all awards have the same "period of performance," synchronized to the calendar or fiscal year. This practice increases the chances of interactions, and might not make sense for people assigned to longer-term projects that overlap years. to market valueTry staggering the periods of performance to limit interactions, and to allow for equal recognition of contributors to long-duration projects. Incentives can actually demotivate. For instance, designating only one "Engineer of the Year" or "Manager of the Year" can be demoralizing when, year after year, we must pass over many important contributors, who might see little prospect of justice ever being done. When some efforts are considered "primary" and others "secondary," the chances of winning awards for secondary activities are usually small, or they seem small to most employees. Summing the total effects of all demoralization, the "X Person of the Year" award might actually have a net negative effect on overall productivity. Would you like to see your comments posted here? rbrenKwdKBAzwHanCQnInner@ChacuICMecnUQDammGaNoCanyon.comSend me your comments by email, or by Web form. I offer email and telephone coaching at both corporate and individual rates. Contact Rick for details at rbrenUgcYNIujjjQXBaffner@ChacRrwlJqGNnMAdRgFYoCanyon.com or (650) 787-6475, or toll-free in the continental US at (866) 378-5470.